Solicitor General Hugh Dorsey Announces His Associate in Big Case. 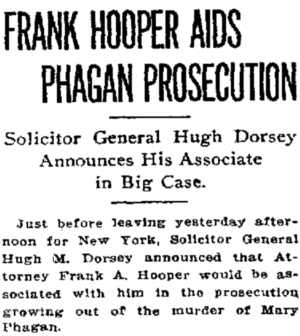 Just before leaving yesterday afternoon for New York, Solicitor General Hugh M. Dorsey announced that Attorney Frank A. Hooper would be associated with him in the prosecution growing out of the murder of Mary Phagan. Saying that Mr. Hooper was his personal choice, Dorsey also stated that Mr. and Mrs. J. W. Coleman, parents of the victim, had been consulted and had directed him to employ such counsel as he desired and that his choice of Mr. Hooper satisfied the Colemans. Attorney Hooper has been a well-known figure at the Atlanta bar for four years. Shortly after coming to this city, he was associated with ex-Governor Joseph M. Terrell, with whom he was connected until the governor’s death. He was for twelve years the solicitor general of the southwestern judicial circuit at Americus, Ga. Among many notable cases with which he played a conspicuous part were the Childers trial in Americus and the famous Cain murder case in Cordele. He was counsel for the defense in each case. He will be in charge of the solicitor’s affairs which relate to the Phagan case during Mr. Dorsey’s absence on his present trip.